Sicario (n.) - Hitman, hired killer, assassin. Emily Blunt stars as FBI Agent Kate Macer who is rapidly making a name for herself in the art of hostage rescue. It's a skill in demand, particularly in the Southwest. Her team operates in Arizona where the drug cartels have been establishing a presence. After Kate inadvertently uncovers a cartel graveyard, she garners the attention of the decision makers in the FBI. Led by Department of Defense "advisor" Matt, played by Josh Brolin, these decision makers draft Kate into an inter-agency task force targeting the cartels. Their mission: cause enough chaos that the drug bosses are forced to come out of hiding. Kate considered herself a street smart agent, but her work with the task force reveals to her how little she really knows. Her partner, a rookie with a law degree, is asked to stay behind. There is no room for lawyers or rookies in the war on drugs the big wigs explain. From Arizona, Kate and the team journey to Ciudad Jaurez. Juarez, as depicted, is a veritable Hell on Earth. An ominous soundtrack and technically impressive camerawork leads the audience into what might as well be a war zone. Kate may have seen some tough stuff in the US, but along the border, dismembered bodies, corrupt cops and sicarios are an everyday thing. Kate heads into the proverbial "heart of darkness" and changes as a result. As with any heart of darkness story, there is elements of xenophobia. Is Juarez "really" that bad? It may or may not be. The film certainly isn't doing it any favors. Regardless, drug violence is a huge international problem, and this film rightfully shocks the audience. 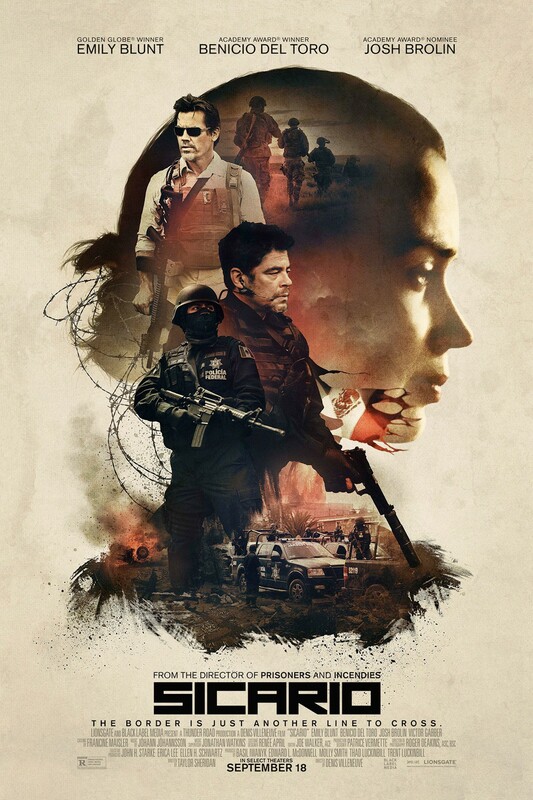 Sicario combines elements of western and detective films, with just a pinch of high-tech thriller. Let's call this hybrid "desert noir." Instead of heavily shadowed and rainy cityscapes, desert noir films are filled with sun drenched, high-contrast vistas. Disenfranchisement has a much shinier veneer this side of the millennium. Sicario is a gorgeous looking film, that occasionally delves into visual flashiness for flashiness' sake. Kate on occasion is also somewhat of cipher, who is just as lost as the audience in the chaos of the film. The film also has a third act change of focus, that somewhat undercuts the film as her journey even if it works to tie up the emotional ends of the film. Blunt gives a fantastic performance as Kate as do her co-stars. Benicio del Toro stars as a mysterious advisor to the team, and Daniel Kaluuya plays Kate's partner, Reggie. Overall, Sicario is a fantastic thriller with fantastic visuals.